Although some wagon trains continued to follow the South Platte, most crossed at one of several fords in this area and took a northwesterly route toward the North Platte River. The trail then followed the North Platte Valley through the remainder of Nebraska. Today's traveler, by following U.S. Highway 26 northwest of Ogallala, will encounter several noted landmarks along this portion of the Platte River Road. One of these is Ash Hollow, a picturesque canyon, near present-day Lewellen. Because of the steepness of the descent, this part of the trail presented one of the most serious obstacles yet faced by the emigrants. Offering spectacular scenery as well as wood and water, Ash Hollow is mentioned in many overland diaries. Several graves, including that of young Rachel Pattison who died of cholera in 1849, testify to the rigors of the overland journey. Northwest of Ash Hollow on Blue Water Creek was the site of a significant Indian battle in 1855. Often known as the Battle of Ash Hollow, this fight resulted in the defeat of Little Thunder's band of Brule Sioux by United States Troops under General William S. Harney. 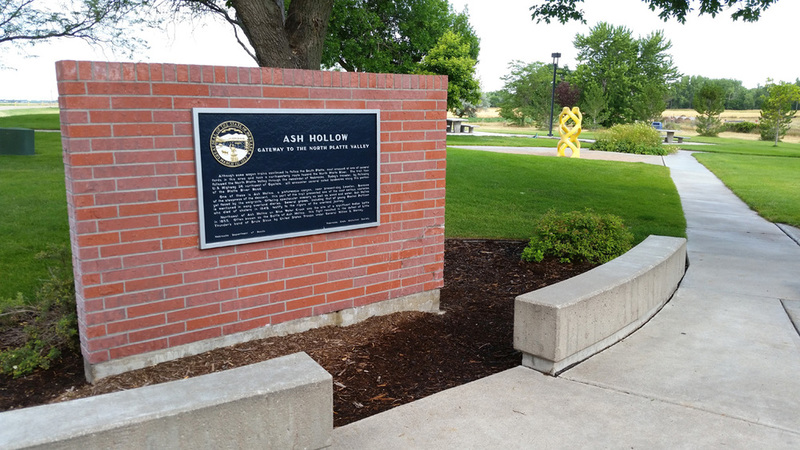 “Ash Hollow,” Explore Nebraska History, accessed April 19, 2019, https://mynehistory.com/items/show/306.